Zinsser Cover Stain®, the all-surface, all-purpose, oil-based primer, sealer and stain killer for interior and exterior use. 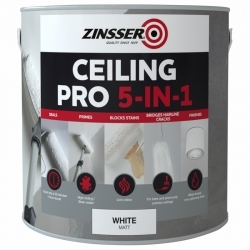 Professional decorators, estate maintenance and project managers have another problem-solving product from Zinsser for priming new and previously painted interior surfaces. This oil-based primer is ideal for panelling, wood trim, old wallcoverings, glossy paints, and clear finishes. After preparing the surface, Zinsser Cover Stain® is recoatable in just 2 hours. Primers and sealers allow for improved coverage and sheen of a topcoat, as well as substrate and surface protection from fungal degradation. This heavy-duty, high end primer seals porous surfaces – plaster, bare wood, masonry, and previously coated drywall – and blocks any tough stains, from nicotine discolouration to smoke damage, and soot to water-stains. It can be applied to metal and other glossy finishes, without the need to sand the surface down prior to application. Maintenance teams will be impressed by Cover Stain’s ability to prime siding, externally facing shutters, doors and windows, metal, cured masonry, and much more. Its high-performance and durable formula will prevent cracking, peeling, chalking and blistering of the newly applied topcoat. Previous surface damage from graffiti, rust, water and/or mildew are a thing of the past, as Cover Stain blocks and seals them, locking it odours and covering dark colours. Even the toughest stains do not stand a chance against Cover Stain®, as the oil-based formula seals and blocks them from bleeding through again, like they can do on ordinary surface primers. Restoration contractors can marvel as decades old smoke, soot and nicotine stain residues are permanently blocked. Old fireplace surrounds can be transformed to a new, modern and chic designs. Cover Stain® can also be used to seal exterior wood, new or old, weathered or untreated, and blocks tough cedar and redwood tannin bleed. Professional users will agree that Cover Stain offers outstanding adhesion, and even sticks to hard-to-paint surfaces, including ceramic tiles, PVC, weathered wood, glass and glossy enamel paint. It can even be used on metal office cabinets and bookcase, transforming old-fashioned looking offices into new, modern and cutting edge designed workplaces. Contact Rawlins Paints for more information about Cover Stain® or other Zinsser products, or alternately download and refer to the product datasheets available. I want to paint over slightly Yellow nicotine stained white emulsion walls without having to wash them down, is there a product that mimics the effect of normal white Matt emulsion that I can just paint over the walls with? The best product for this job would be the interior Zinsser AllCoat (Solvent-Based). This has a matt white finish and can be left as the finish coat. It may take 2 coats to cover if you are not washing down but if the staining is very slight you may do it in one coat. Zinsser Cover Stain should be fine for this. Provided the surface is clean and free from any waxes or spray polish type materials, the Cover Stain will bond well to the old varnish and provide a good base for a suitable exterior top coat. What is the best primer/sealer/undercoat to apply to exterior marine ply and softwood? Planning to apply 2 coats of Sadolin Superdec on top. Zinsser Cover Stain would be the best primer to use. Can you thin cover stain? 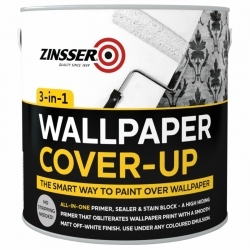 Zinsser Cover Stain shouldn't be thinned for application as it is designed to be applied as supplied but you can use White Spirit for clean up. Question: Can Zinsser Cover Stain be used to seal weeping knots? No. You would need to scrape away any residue, thoroughly clean the knots with methylated spirits and then apply 1-2 coats as required of Zinsser B-I-N. The ultimate performance shellac-based primer-sealer and stain killer for interior and spot exterior use. Offers unparalleled adhesion to glossy surfaces (including glass) without the need for scuff sanding and blocks stubborn and persistent stains. 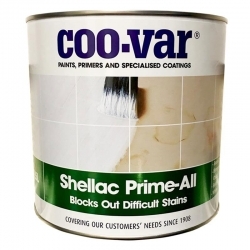 Coo-Var Shellac Prime-All is a heavy duty, shellac based coating designed to block out difficult stains and odours. Ideal for sealing tar, bitumen and creosoted surfaces and to prevent bleeding through in subsequently applied solvent based paints. It exhibits heavy stain blocking from nicotine, pen, oils and water stains and has rapid drying properties. 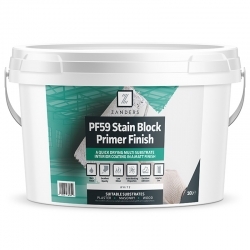 A unique, water based product that will hold back most normal stains helping to prevent bleed through that can cause unsightly staining on new paintwork. A Water based, low tension, matt renovation and stain blocking paint for use on interior walls and ceilings based on modified alkyd resins. 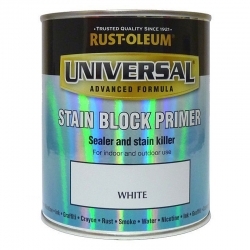 Rust-Oleum Universal Stain Block Primer is a special primer to be applied before Rust-Oleum Universal All-Surface Paint. 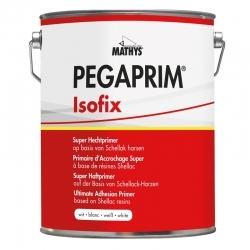 It has be specially developed to block stains from bleeding through finished paint film. Super adhesion and stain block primer for interior and exterior use. Produces good adhesion on metals and smooth hard surfaces. An outstanding all-purpose, all surface primer, which is great for all interior and exterior surfaces - sticks to the glossiest surfaces and blocks difficult stains from appearing on your interior and exterior painted surfaces. 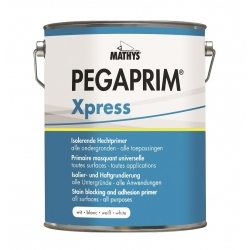 Mathys Pegamat RL Isole is a deodorised low tension solvent-based insulating and satin blocking paint based on plastified acrylic resins.